Georgia native Xavier Roberts was a 21-year-old art-school student paying his way through college when he designed a doll with an unusual (and disproportionally shaped) head in 1976. At first calling them Little People dolls, Roberts created them using a traditional German fabric-sculpture art and eventually started his own company. After a TV appearance on the television show Real People in 1980, the dolls' sales spiked, sending America's kids into a "Gimme!" frenzy. Fearful of disappointing their young ones, parents camped outside toy stores during the Christmas season of 1983, determined to bag one of the coveted moppets. By New Year's Day, more than 3 million Cabbage Patch Kids had been sold; the madness eventually inspired the 1996 Arnold Schwarzenegger movie Jingle All the Way. 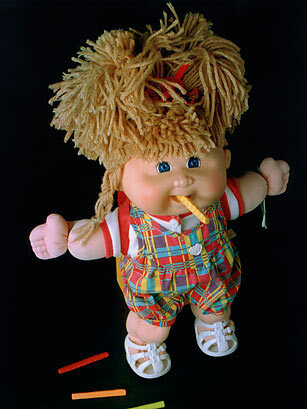 Read "The Strange Cabbage Patch Craze."